This is my baby. 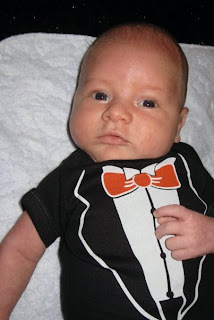 He is auditioning to be the youngest James Bond. My family, minus Laura. Also minus a lot of shoes, because they live in Oklahoma now. Seriously family, wear proper footwear. On his first plane ride, in his daddy's arms. He was a super trooper, didn't make a peep on the plane! On the dance floor at the wedding. I believe he was being introduced to the awesomeness of pre-Neverland Michael Jackson. Uncle Dan. I don't think he likes your music, Dan. The wedding was legen... wait for it... I hope you like milk because here comes the DAIRY. For several reasons, there was a ridiculous choreographed dance to Beyonce, Spaghettio's, a magician, and also my son remembered to "suit up". Katie and Stina... I'm lacking a LOT of pictures of friends holding the baby. Whoops. If you have one of you and my child, send it my way please. Alison! We watched my new favie, SYTYCD together and hopefully, I got her hooked. We were happy that we got to see them while they were in DC. You can tell I am doing a great job of showering frequently. It was so fun to introduce Finley to so many people we love. And I don't think he got the swine flu! He is up to 11lbs 2oz and just got another cast. He's moving right along. That's all for now. Here is our smart dog Copper, guarding the crib. While Copper may be developmentally ahead of Finley (Copper can walk, sit...), Finley has mastered the one trick I can't seem to teach Copper. And for that, Finley gets a point. The smiles make me happy and a little sad. I love that he is reacting to us more and more and becoming a little person... but I am sad to think that he is slowly going to transition from being my baby to a little man. People keep telling me how fast they grow up and instead of cherishing moments, I am wistful that everyday he changes so much. I am going to make an effort to celebrate him more. Because how cute is that smile? I'm pretty thrilled to be on the receiving end of millions more of those smiles. I'm a lucky, lucky girl. We had Finn's 4th foot appointment today, and they are giving him a week off with no cast! The skin on his foot needs a little time to stretch and readjust before the next cast. His foot has moved to the normal position, but there will still be a few more casts to go--they over correct the foot so that eventually it will settle into normal position rather than the initial position. The sad news is that I have to do a little physical therapy on his foot every time I change his diaper and he doesn't really like it. It's basically just stretching his foot so that it remains limber, but he screams a lot when you mess with the foot. I think he just isn't used to having anyone touch it, because he is totally happy as soon as you let go. I'm excited that his time with family and friends will be extra cuddly. And we're excited to give him a real bath and get his smelly leg really clean. It's been too long, which means this post is too long. Yes, it's hard to remember to update. So since our last update, we have celebrated Mother's Day, our first solo outing and my birthday! We celebrated Mother's Day with Sol's parents and his sister Summer... and my body celebrated by trying to kill me. I got really sick and laid (layed??? 1 point for anyone who knows the right word) in bed the whole time. It was really sad because I felt like a failure of a mother because I couldn't take care of my baby on Mother's Day. The first solo outing was quite successful and was to a destination that I hope my son learns to love over the years... the Paper Source. Many of you know of my quest to visit every PS in the US of A, and Finley is helping me, one store at a time. I think he really liked it. One great (and also terrible) thing about shopping with him is that he limits my spending. I went in to the store, got exactly what I needed and left. I have a tendency to buy things I don't need and I was so scared he would start yelling (but really, how could you get upset in such a lovely place??) that I shopped super fast. Oh, Paper Source, I love you and all your pretty colors and coordinating accessories. And then my birthday! It took Sol and I a little bit to figure out if I was turning 25 or 26, but eventually we settled on 26 (is that right, mom?). The years start blending together. We went out to lunch, which was 95% successful, and ran errands. 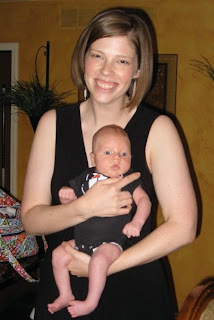 It was so fun--I loved being able to do the things we did before Finn came along now that he's here. We're still learning how to take him out. :) And then my husband made me a delicious meal and it was great. Most importantly, we had a Dairy Queen Blizzard cake! Delicious and nutritious. Finley is doing well... we had a rough patch when I got sick and he decided to have a growth spurt, but things are settling down now. He's decided he can only sleep when he is close to us, which is a little challenging, but fun because we don't mind being around him. His crib has turned into a very underused piece of furniture. He gets cast #4 tomorrow, and our doctor said he was making great progress at the last appointment. We are headed to Tulsa and Wichita on Thursday. Finley gets to meet his uncles, great grandparents and his many "aunts" in the BSC. We can't wait. I love "How I Met Your Mother", specifically I love NPH and... actually I love the whole show. I love "The Mentalist"! Sol and I watched 2 episodes, and besides being entranced by Simon Baker's hair, it is a really good show. It's a lovely cross between Monk and Psych. I can not wait 9 months for LOST. I could barely wait 9 months for Finley and I like him way better than LOST. (I know, right? I clearly like him a lot.) What about Jacob? Juliet? Sayid? I can't handle it. Also, I love "Big Love" and "Mad Men", shows I Netflixed because I never got the the chance to watch them. They are really great shows. I am starting to get concerned about what will happen after the rest of the finales air... Luckily, I think there are still 3 more episodes of the late Pushing Daisies to air. I will be watching A LOT of HGTV. Or maybe I should get a new hobby. Suggestions? I'm not doing a very good job at updating. Finley's just so cute. I don't have much to say about him, except he is precious. He loves to look at lights and sometimes makes a little fish face (second picture). I still think his crying and sneezing and everything is so cute. He beat his birth weight by 9 ounces at his two week check-up (meaning he weighs 9lbs 2 oz now, for those of you who are math challenged). He is a hungry and growing kid. He doesn't cry very often, and when he does he is super easy to calm down. He really is a joy to be around. Here are some pictures, they say more than I can. I only have one funny story that's happened in my first week at home alone... and the main character is not little Finn, it is my crazy dog Copper. Sol accidently left the gate open earlier this week and our nutso dog escaped. It was several hours before I realized that the manic barking from the front yard was our dog. So I went out (in the rain) to get the soaking wet dog. And to him, its a game, so everytime I get close, he runs away. Or spins in a circle. Seriously, the dog had more crazy in his eyes than I have ever seen. Several of the neighbors are out with treats, but he will not be persuaded. So I keep running inside to check on the baby and eventually Copper takes off down the cul-de-sac... so I have to get in the car to track him down, and I can't find him. And I'm freaking out because I left Finley alone (for about 6 minutes). And I call Sol about nine times to come home and get the dog... no answer. So I race back to the house to check on Finley (he is still sleeping), then I get a phone call. Without looking at who it is, I start explaining to Sol that I need him to come home. Oh no, it's not Sol. It's some people who are coming by from craigslist. So they come over and while I am talking to them in the driveway, my ninja dog slowly creeps toward me. He hides behind bushes and trees and keeps getting closer... after the people leave I turn to walk back in the back yard and the crazy dog trots in ahead of me. I guess he had enough. I wanted to punch him in his soaking wet face.